My mom has passed so I have to enjoy and celebrate my friend's moms. 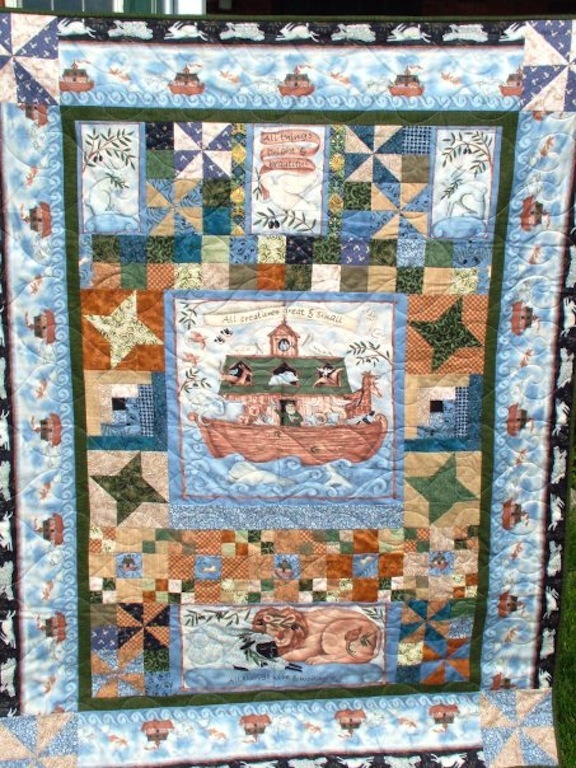 I was out when I saw an amazing pattern that had embroidered frogs on it made into a quilt. My BFF, the one that got kicked in the head by her horse, her mom collects all things frogs. Of course I thought she *needed* this quilt. I know that I don't have time to do all the embroidery and put the quilt together. and asked her if her mom might like to stitch these for me if I gave her the fabric and the floss? So she asked her mom and voila! I'm hoping to get these pressed and trimmed up this weekend. If I'm lucky I may get the blocks cut out too. I really need to get on my dad's quilt first though so it may not happen this weekend. At least I have another month away from the gym. I didn't realize how much of my time was taken up with going to the gym too. Last night DH asked me where I was going. I looked at him, puzzled, b/c he knows I am not going anywhere. I answered, "I'm not going anywhere". Yes it really is as good as the cookies, maybe better! I made it last night and thankfully left it at home. I would seriously have eaten it ALL if I was anywhere near it. I found the Recipe at Barbara Bakes here. Combined 2 1/2 cups flour and baking powder in a bowl. In a separate bowl, cream butter and 2 c. sugar, salt and cinnamon until fluffy, about two minutes. Add eggs one at a time mixing well after each addition. Add vanilla and sour cream and mix to combined. Add flour mixture stirring until just combined. Coat the cinnamon chips with 2 T. flour and stir into batter. Spoon batter into four/five greased mini loaf pans (5 3/4 x 3 1/4 x 2 1/4. Don’t fill more than 2/3 full.) Combined 2 T. sugar and 2 t. cinnamon and sprinkle over the top of batter in the pans. Bake at 350º for 35 to 40 minutes until a toothpick inserted into a crack in the center of the loaf comes clean. Remove from oven and let cool 5 minutes before removing from pan. Note: You can also make this in two 9×5 loaf pans. Bake at 350º for 60 to 70 minutes until a toothpick inserted into a crack in the center of the loaf comes clean. send me some blues for my dad's quilt. I received more in the mail this week. This is a GREAT thing as I need to add some more variety to the mix. Also I received a package from Australia from Badskirt Amy. She just happened upon some Mendocino and I scored BIG with her help. These blues also came along from Amy. Hey, so I just noticed the black spots on both of these pics. I will have to check and see if that is really on the fabrics when I get home! The other is from Jan Maree. I did manage to get a quilt bound this week but have not been able to get any photos, hopefully soon! DH came home last night and it was good to have him home. so the dog was allowed. I think she almost had a heart attack when she saw him, it was hysterical!! She may be even more excited to see him than I was! LOL. The cats were not impressed. I'm back to work today and I can't believe it is almost time to go home already! The day went by so quickly. Just thought I would take a minute to share the progress I've made on my dad's quilt top. I managed to sew (after loads of unsewing) the first 4 rows of the quilt. I have 2 rows of 2 sewn together. I like the effect so far. it made her want to learn! 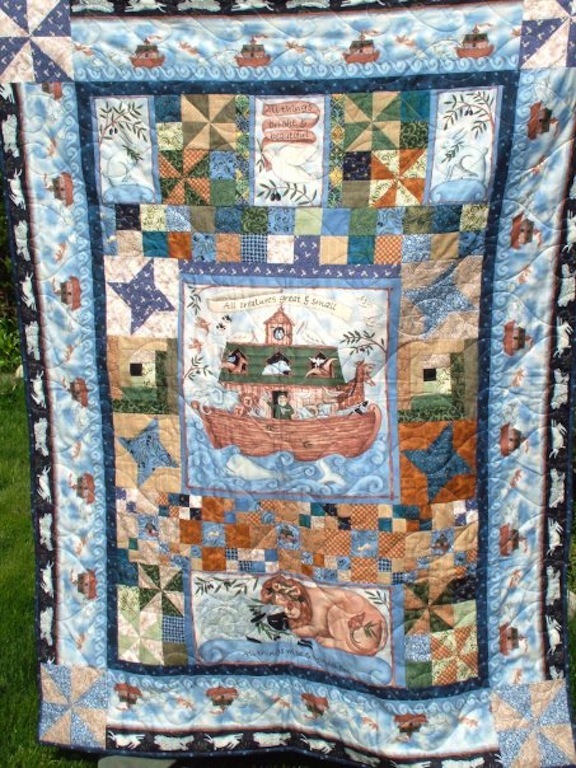 Specifically these two Noah's Ark quilts that I made using a panel and designing around them. I made these for a friend that had twins. So anyway, my new quilting friend is Stacey, and she just started a quilting blog. 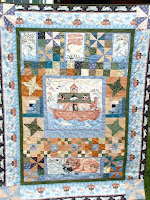 Her blog is called "My Old Quilting Soul". So if you have a minute pop on over to her blog, leave her a comment, maybe even become her newest follower! She would be so happy to have you. It's so important for us to encourage new talent! She is already talking about fabric she *needs* to buy. Welcome to the club, Stacey!! Tell her Mama Spark sent you! It's a little hectic around here today for me, but not for someone! I used Mr Random Number Generator to draw for the prizes today. We had three winners since my followers went over 500. "I am now a follower of your blog. Thanks for the opportunity to win your giveaway." 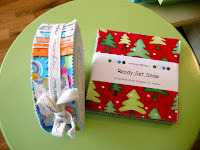 She chose the Ready Set Snow charm pack. "I discovered you when we were both participating in a doll quilt swap quite a few years ago--coincidentally, I just took the quilt I received in that swap into my new job ... in a sea of beige cubicles and no window in sight, I really needed something interesting and colorful in my environment." She will receive the birdie panel. Thanks to all my wonderful followers, and to Barb and Mary at Me and My Sister Designs for providing such great prizes!! I guess I'll have to go back to the shop I bought the panel at and get myself another one!! I will be going back to work tomorrow after an entire month off. Part of me is looking forward to it and part of me is dreading it. OK, off now to finish laundry and do some sewing on my dad's quilt. I did manage to get 2 whole rows sewn together yesterday!! I would love to get 2 more done today! I was so very excited to start on the pieced part of my dad's quilt today. I made 2 blocks and went to put them with the snowball block and guess what? The triangle corners on the snowball block were too big!! Now I learned something last year about putting a small square on a larger square and flipping it to make the triangle that I am going to share with you. DON'T CUT THE EXCESS OFF. The reasons, for me anyway, are two fold. 2-It helps keep your block square. Kind of acts like a foundation. I would have been sunk today if I had trimmed like I used to. I took some photos to show you what I mean. I left all three layers intact as you can see here. Sure made my life easier today! Now for some tips on reverse sewing. I don't know about you but I HATE reverse sewing. These are some things I learned that make it slightly less painful! Which makes all the ripped pieces pop up. Then I use a piece of tape to get all the little broken threads off the fabric. It keeps the work area clean and I feel it is probably less stressful for the fabric you are taking the threads out of. Another thing I learned today, since I had to re-cut all the corner squares from 3 7/8" to 3 1/2"was that if I pay attention to the way I turn the square, I ended up with the previously sewn line off set. I felt like that was better in that I would not have to sew directly on the old line. You can see what I mean here where you can see the old sewing line and now if I sew corner to corner it will not be over the old line, keeping the fabric stronger. Did anyone happen to notice there is not a drawn line corner to corner on this square? I hate drawing those lines so I found a tool to use so I don't have to. There are 2 out on the market that I know of, The Angler 2 and Clearly Perfect. I used to use The Angler 2 but now have Clearly Perfect. I put my fabric where I want to start sewing and line the bottom "point" up with, in this case, the center line on the CP and as I sew I keep that "point" aligned with the center line on the CP. Interestingly, you don't watch the needle but rather the "point"
keeping it on the center line as you sew. Sure beats drawing all those lines!! It is also an awesome tool for making HST too, although you align your fabric differently. The CP allows for making fairly large HST blocks b/c the lines extend quite a way. One more tip I learned recently is that you should pay attention to how you load your bobbin into the case, if your machine has a bobbin case. By that I mean whether thread goes "over" the bobbin or comes from "under"
(kinda like your TP roll). If you hold your bobbin case and gently pull the thread the bobbin should spin clockwise. For my Bernina it means I load the bobbin into the case with the thread coming from "under". Anyway, the pieced blocks are a snap to sew together and I have managed to get a few sewn together, hey it's a start right? They are turning out soooooo cool!! I hope you are all having a better day than I am so far. The good news is I have all day to work on this! You, my bloggy friends are simply the BEST!! so many of you have asked me about. So if you have not left a comment on the post with the giveaway here, and you would LOVE that birdie panel, scroll down and leave me a comment here. I will be doing the drawing on Sunday, so you still have time!! I would love to thank all the wonderful people that decided to become new followers too. From the "boys" in the family. When my kids were little the boys would buy Valentines for the girls and visa versa. This note from my 21 year old son? I hope you all had a wonderful Valentine's day. Comments are now closed, I will draw the winners today. Thanks to everyone that commented! That's right!! This is my 1000th post. Who knew I had so much to say? I was trying to figure out what to giveaway when it hit me. I emailed a good friend of mine, Barb, from Me and My Sister Designs. She generously offered up a honeybun of Happy and a charm pack of Ready Set Snow. So there you go. That's what's up for grabs. Let's split it into 2 winners. One person will win either the honey bun or the charm pack. The first name I draw will get their first choice. Here's what you need to do. 1-Become my follower via Google friend connect (or let me know you are already a follower) and leave a comment telling me you did. 2-Let me know how you found my blog and which prize is your first choice. I've always wanted to know how people found my blog for the first time! for an extra chance to win. Three things, three comments and three chances to win. and thank them for their generosity!! They are going to be involved in a couple of blog hops soon so it would be good to find their blog! I first met Barb and Mary at spring market last year. They are 2 of the sweetest women I have ever met and sooooo much fun!! Thanks ladies for your generosity! I will draw for the prizes on Sunday night EST, February 19th. One of the things many of you have been asking me is the name of the fabric line the bird panel comes from. So here you go, it's called World of Susybee for Hamil Textile Design #SB20139. The shop I got the panel from is called Quality Quilting. This is their phone number (734) 929-5169, so if you need them to send one to you, give them a call and I bet they would be happy to send it to you!! 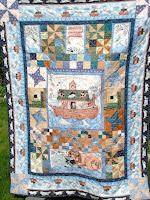 I thought I would show you some of the blues that I have received from a few blog friends for my dad's quilt. Thanks Dar and Diane. I also received a package from Mary. She was very generous with many colorful Christmas fabrics! I forgot to take a photo of them though, but thanks to you too Mary! It has been so fun to receive these little fabric bundles. I was sitting in my family room watching tv and this is what was sitting on my right. I love my cats! I love my blog friends too! There is a new quilt shop in my area. A local shop went out of business and was bought by a local LAQ. Some friends called me yesterday and wanted to go to the shop and they wanted me to go with them. So I went out to breakfast with my daughter and then went to the quilt shop with my friends. This is what you see when you drive up. Then we went inside and boy was it packed. This was the main part of the shop. I found a few things that needed to come home with me (of course). Wanna see? I thought this would make a really cute back for a chenille blanket. There was a panel that went with that and it is about a yard too so I bought it. Thought it would make a really darling baby quilt. I also fell in love with these crazy looking birds. I'm a sucker for cute and seem to always have a ton of baby quilts to make! They kind of remind me of the stuff Carol does. I also got this cute package of buttons. I was looking for the last Aunt Edna fabric I was missing and so asked if we could go to the JAF in Ann Arbor and so we stopped there too. Lo and behold, I found the elusive fabric I was looking for. I had a fun time and I'm so happy they asked me to go. I just realized how close I am to my 1000th post. I think 2 more posts and I will have written 1000 posts. I guess I have a lot to say.
. Hmmm I'll have to think on it and let you know. I sure do appreciate all my readers and followers too. Staying Home Is Bad For My Pocketbook!